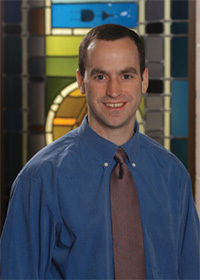 James Schmiedeler, associate professor of aerospace and mechanical engineering at the University of Notre Dame, is the recipient of the 2012 Rodney F. Ganey, Ph.D., Faculty Community-based Research Award, which is given annually by the University of Notre Dame Center for Social Concerns. Schmiedeler has an extensive record of research and scholarship in several fields including robotic-assisted rehabilitation and the dynamics of bipedal walking motion. The award, in the amount of $5,000, honors a Notre Dame faculty member whose research has made a contribution in collaboration with a local community organization. 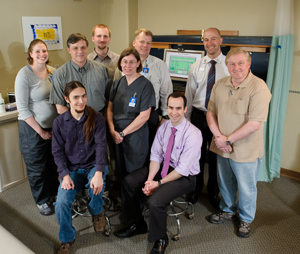 Schmiedeler and his Notre Dame colleagues in collaboration with the therapy staff at Memorial Hospital in South Bend have developed a technological innovation called “WeHab,” which uses the Nintendo Wii Fit platform to assist individuals who, as a result of strokes, accidents or illness, experience weakness, paralysis or impairments in balance and mobility. Already, more than 60 local individuals have benefited from this innovative, low-cost tool that provides biofeedback and data monitoring during balance therapy. According to Schmiedeler, the WeHab system facilitates common rehab activities and measures patient performance in real time. In the clinic, it helps therapists improve rehab effectiveness and objectively assess patient progress without taking time away from rehab activities. Once patients go home, the low cost makes individual access affordable; the WeHab system can provide biofeedback during prescribed at-home activities and monitor patient compliance through progress reports. The results of the work are currently in use in Memorial Hospital’s inpatient and outpatient rehabilitation setting. As development progresses, the product will become available for private use clients and on a commercial basis, so other health care facilities will be able to use the application at their sites. Schmiedeler received his Ph.D. from Ohio State University in 2001. His current work focuses on biped robot locomotion, human recovery from stroke and spinal cord injury, robot-assisted rehabilitation, prosthetic devices, mechanical energy storage for vehicles and the design of shape-changing mechanisms. The Ganey Award is funded by local entrepreneur and philanthropist Rodney F. Ganey, and awarded by the Center for Social Concerns. The Center facilitates community-based learning, research and service for Notre Dame undergraduates, graduate students and faculty. Since 1983, more than 15,000 students and hundreds of faculty have been engaged in its courses, research and programs. Originally published by John Guimond at newsinfo.nd.edu on April 11, 2012.